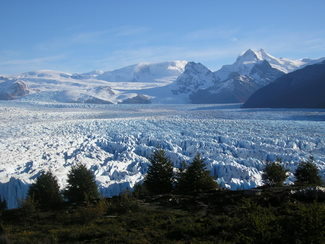 Founded in 1943, Parque Nacional Los Glaciares is the largest and most visited in the Argentine National park system. In 1981 the United Nations declared it a Patrimony of Humanity. 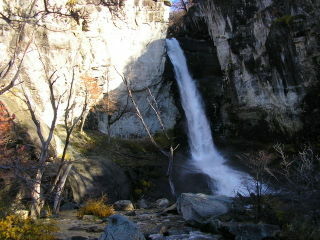 It is accessible in the south from El Calafate and in the north from El Chalten. 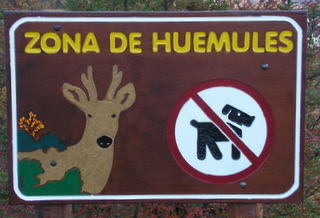 The Park protects a stunning range of Andean peaks which are awesome to view and prized by climbers. 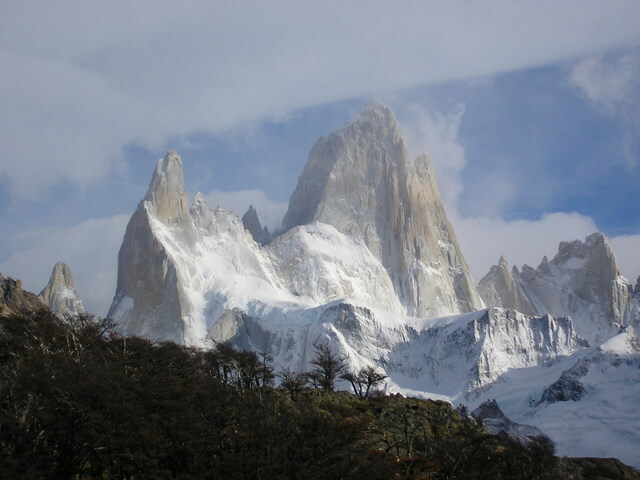 Cerro Torre, at 10,000 feet certainly not the tallest mountain, is one of the most difficult and dangerous to climb on Earth. Monte FitzRoy (11,000 feet) is its equal in beauty and difficulty. Numerous glaciers stream down the sides of these mountains into pristine green-blue lakes at their base. 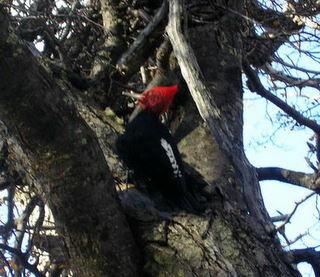 Waterfalls, streams, old growth forests, mesetas (a high elevation plateau), the Redheaded Patagonian Woodpecker, the Huemules (the endangered, and extremely shy, Patagonian deer) are just a few of the beauties of Parque Nacional Los Glaciares. 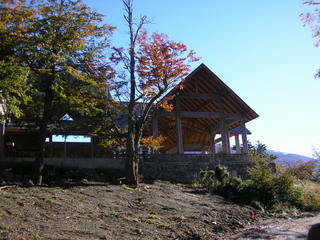 For hikers and trekkers, the park is well laid out with marked trails of varying length and difficulty. 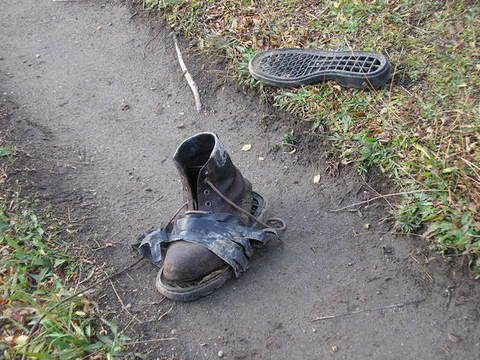 Trekkers who are on multi-day camping journeys, must register with the park office. Rules are enforced: trash (pack in/pack out), cook stoves only (no open fires) sanitation (300 feet from any water source), no bathing (in 45-degree water?) or washing of clothes and utensils in the streams and lakes. I’ve rarely seen such pristine landscape. You are encouraged to drink the water from the streams because its source is the pure glaciers and it means one less container brought into the park. 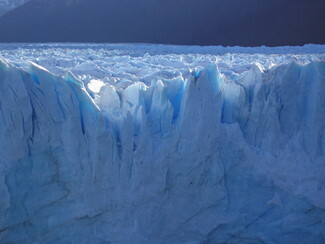 The mother source of all this glacier glory is the Hielo Continental Sur, the largest ice sheet outside of the Antarctic continent and one that is not melting! It literally covers a vast expanse, over 6,000 square miles, on the top of the southern Andean mountains and effects southern Patagonia and Tierra del Fuego’s weather creating the fierce western winds, frequent rain showers and winter’s heavy mountain snow fall. 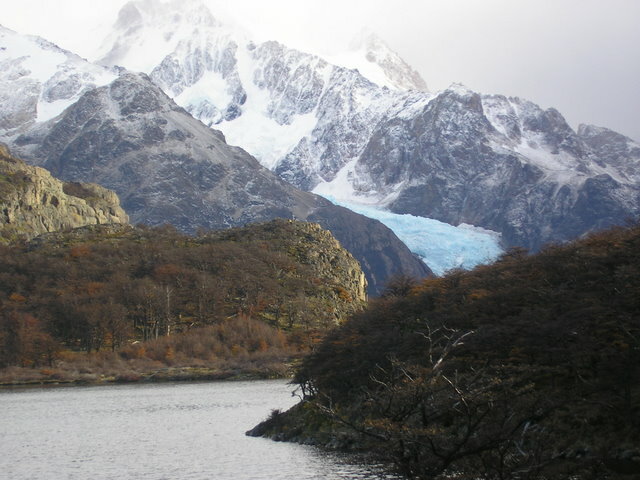 (Oddly enough, under 1,000 feet altitude Patagonia is not a snowy area and in winter the winds actually diminish due to the effect of being on the leeward side of the mountains). 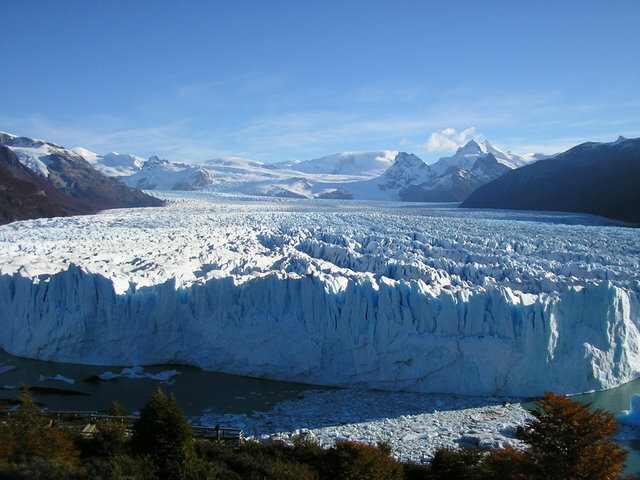 Of all the glaciers, the park’s tourist star is the Glacier Perito Moreno, one of the Hielo Continental Sur's 49 glaciers as well as one of the few on Earth still advancing. A visitor can get to within 1,000 feet of its massive, crunching, iridescent blue magnificence without trekking for hours. 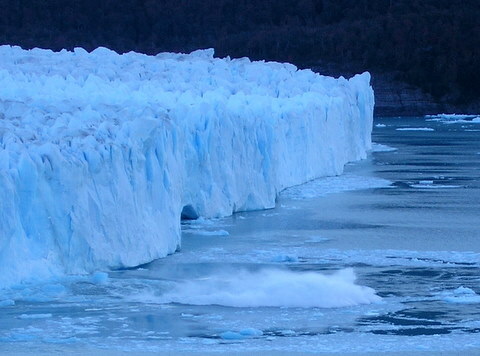 Reached by car, taxi, tour busses, small excursions or hiking 45 miles from El Calafate, you have two options to view the glacier, and I recommend that you take advantage of both. I traveled in a group of four (New Zealand, Columbia and myself) with a guide for a 7-hour tour. On the way we drove along Lago Argentino and past several working estancias where the herds of sheep blended into the landscape. 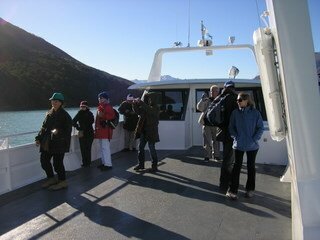 Our guide pointed out features of the plant life and wildlife, stopping several times for photo ops. Once in the Park, the landscape changed dramatically from the low hill scrub to beautiful forests of pine, linga and beach as we drove into the mountains. 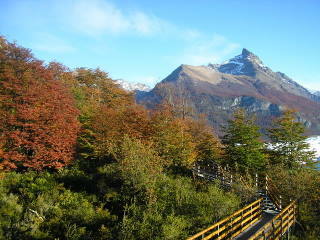 The first view of Glacier Perito Moreno is from an overlook just before reaching the café. It takes your breath away - and that’s not just a cliché. 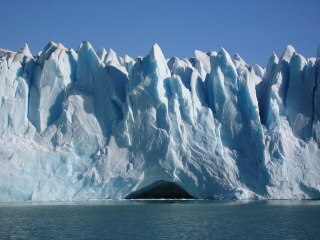 Our guide suggested we take the one-hour boat excursion that sails within 1,000 feet of the glacier. Why only 1,000 feet? Because huge chunks of ice regularly break off the front crashing into the lake below. The boat simply sails to the North Face and allows you to observe. 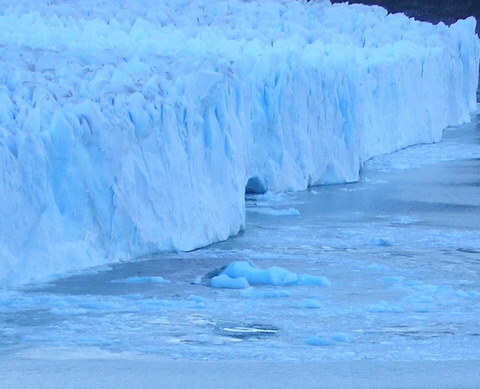 What you observe is a 180 foot wall of fissured ice over one mile long. The fissures reflect the sun creating iridescent blue color that a lighting engineer could not have accomplished. But what you hear is startling. 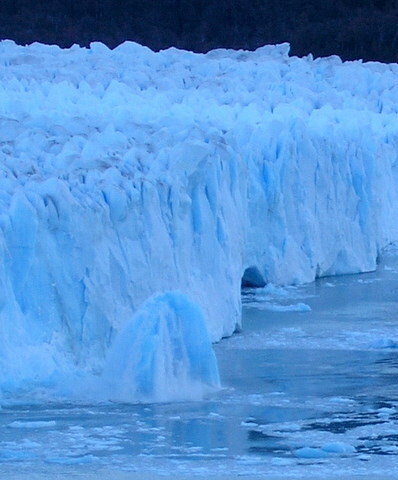 The glacier grinds, pops - from target shooting rifle to cannon sounds - and at least every 10 to 15 minutes you hear the roar, and/or see the huge pieces of ice break from the wall and smash into the lake creating wave action and icebergs. The guide informs us that although the visible wall of ice is 180 feet high, what we don’t see is the 2,700 feet of glacier under water to the lake bottom! 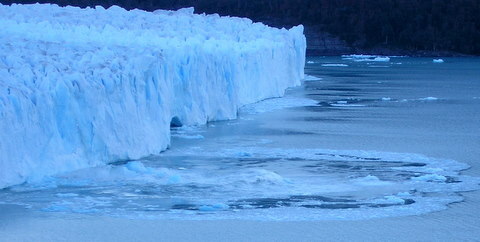 The following series of photos captures an ice chunk breaking away from the wall of the glacier, plunging into the lake and finally reemerging as a small berg. Our final stop at the café was to walk the elevated trail that takes you down the mountain allowing you to view both sides of the glacier wall as well as the entire expanse. It is massive, a jagged sheet of ice as far as the eye can see finally climbing up the mountainside. Observing the glacier from above, its sounds seemed amplified. By late afternoon, the angle of the sun cast fascinating shadows over both the ice and mountains, and I did not want to tear myself away from the site. The excursion cost AR$110 (US$30), entrance for foreign visitors to the Park was AR$60 (US$16.50) and the boat excursion was AR$50 (US$13.75). Optional guided ice walks are available on the glacier itself as well as extended boat excursions to other glaciers in the Park. All excursions can be arranged through your hotel or hostel.